Vegetarians, this one is not for you. For the rest of you, New York City’s DBGB Kitchen and Bar is a meat lover’s paradise with dinner menu items ranging from a $9 sausage to a $495 entire pig that feeds 8. Renowned French chef and restaurateur Daniel Boulud is a culinary icon. With restaurants all over the world, Boulud’s namesake restaurant, the 3 Michelin starred DANIEL is a New York City legend and perhaps his most well-known endeavor. But if you’re looking to experience the Boulud touch and loosen your tie or let your hair down, than look no further then DBGB Kitchen and Bar. 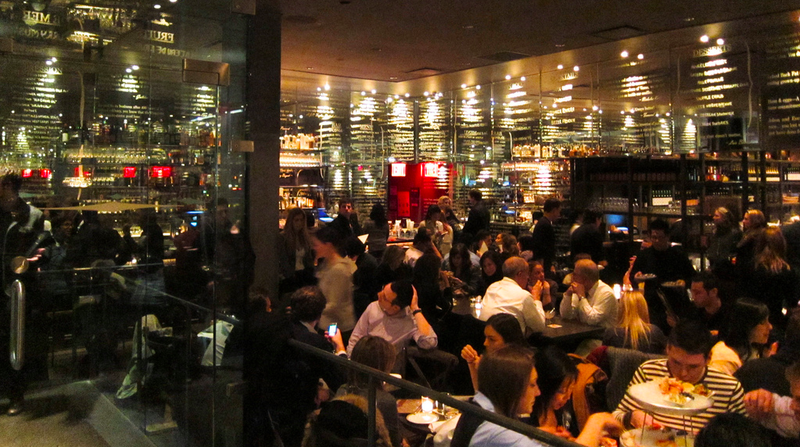 DBGB is Boulud’s fifth restaurant in New York City and his first downtown. Located in the East Village, DBGB is a lively and unpretentiously elegant brasserie serving up burgers, sausages, and fare from Boulud’s homecity of Lyon, France. There’s also a massive and impressive lineup of craft beers offered on tap and by the bottle. 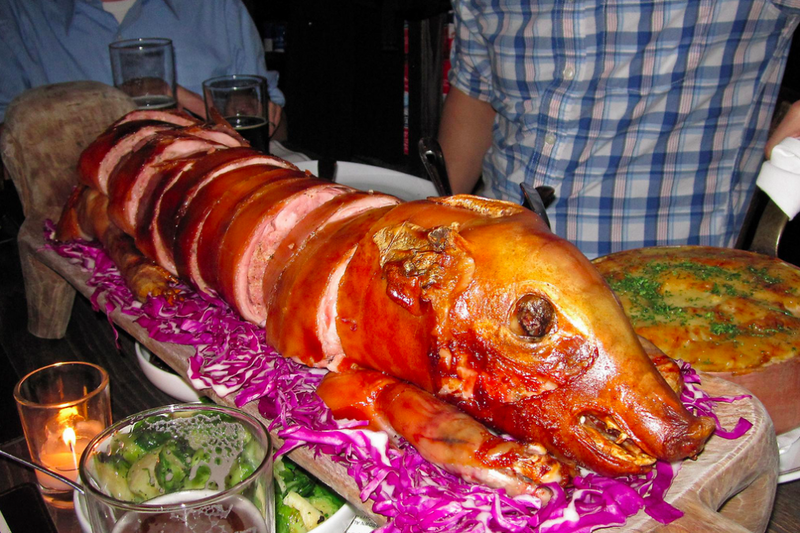 Although many items on the menu piqued my interest, I came here for one thing and one things only: the whole hog. The Splurge: Live a little and splurge on the whole hog. For $495, you and 7 friends can feast on a three course meal with an entire pig at the center. The meal starts with a house-made Fromage de Tête, also know as head cheese. Head cheese is made with pieces of meat from the head of a pig (cheeks, snout, tongue), cooked with chopped vegetables and a variety of seasonings, then molded into a block and served sliced and cold. It serves as a nice introduction to what’s about to come. After the Fromage de Tête it’s on to the Pièce de résistance…an entire, slow-roasted suckling pig stuffed with wild mushrooms, Swiss chard, chestnuts and smoked pork belly. To complement the hog, 3 family-style helpings of roasted root vegetables and apples, brussels sprouts with smoked bacon, and potato gratin (also known as scalloped potatoes) are set around the pig centerpiece. Finally, after pigging out on the main course, it’s on to a dessert finale of flaming baked Alaska flambéed with kirsch (a sour cherry brandy). Just like the rest of the meal, and hopefully the check, this too will be split evenly amongst your group. Every now and then, amidst the same boring salad or burger eaten on-the-go, we need a memorable meal to remind us of the joy of eating. Ordering the whole hog is memorable, plain and simple. It also serves as a great excuse to gather a group of friends around a table to dig in and share a meal together. And besides, how often does an entire suckling pig arrive at your table? I’m going to venture a guess and say never…until now. If you’re still not convinced, look at it this way: you’re getting a highly memorable 3-course meal at a restaurant owned by one of the best chefs on the planet for $61.87 ($495 / 8 people). “But then there’s drinks, tax and tip,” you’re saying to yourself. Yes, that’s true. 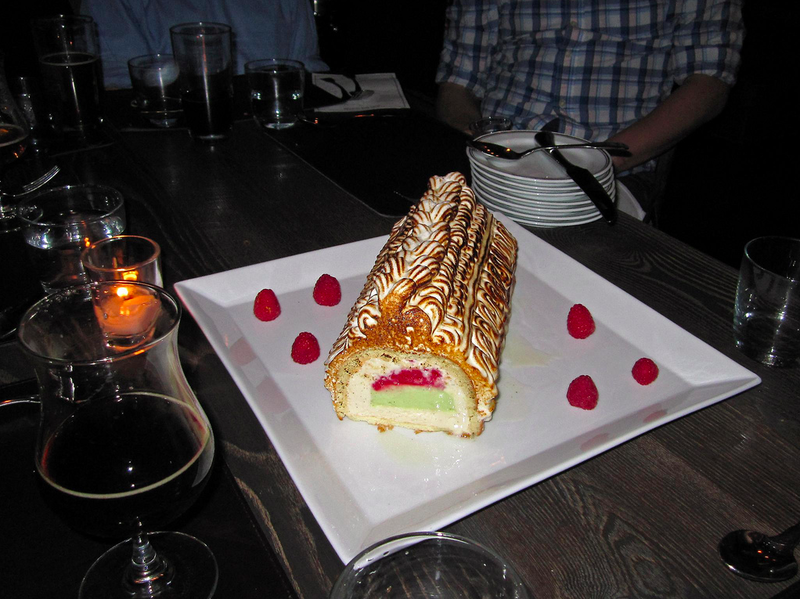 Luckily for you DBGB has a special drink offer for those ordering the whole hog. For $200, everyone at the table (maximum 8 people) gets all the craft beer they can drink. At $25 per person, that’s a good deal. The grand total per person will likely be just shy of $120, but hey, this article is called “The Splurge” for a reason. 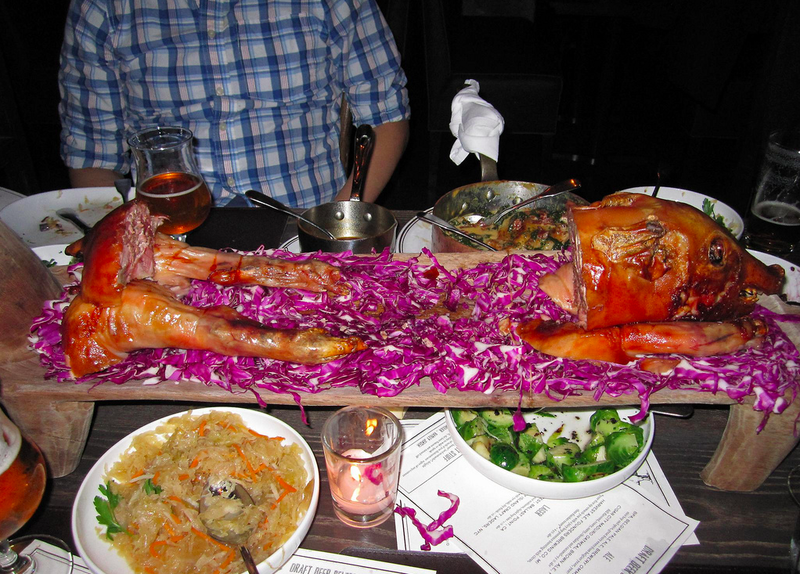 Tip: You’ll need to reserve your whole hog 72 hours in advance of your meal by calling the restaurant at (212) 933-5300. Anti-Splurge: If you’re not quite ready to splurge on the whole hog, DBGB has a wide selection of affordable dinner items, with sausages starting at just $9 and burgers starting at $14.